The U.S. Food and Drug Administration (US FDA) is responsible for assuring that food sold in the United States is safe, wholesome and properly labeled. This applies to food produced domestically, as well as food from foreign countries. The Federal Food, Drug, and Cosmetic Act (FD&C Act) and the Fair Packaging and Labeling Act are the Federal laws governing food products under US FDA jurisdiction. The Bio-terrorism Act requires US FDA registration for domestic and foreign food facilities, that manufacture, process, pack, or hold food for human or animal consumption in the U.S. Owner, operator, or agent in charge of domestic or foreign food facility is required to register their facility with the US FDA. Domestic facilities require FDA registration whether or not food from the facility enters interstate commerce. Foreign food facilities that manufacture/process, pack, or hold food also require US FDA registration unless food from that facility undergoes further processing (including packaging) by another foreign food facility before the food is exported to the U.S. However, if the subsequent foreign food facility performs only a minimal activity, such as putting on a label, both food facilities require US FDA registration. Acidified and law-acid food manufacturers require FDA food canning establishment (FCE) registration also. The dietary supplement manufacturers also require US FDA registration. The US FDA food facility registration was a one-time registration process till FY 2012. The new FDA Food Safety Modernization Act (FSMA) requires Biennial Registration Renewal for domestic and foreign Food Facilities. Previously registered facilities should renew the registration between October 1 and December 31 of each even-numbered year starting from the year 2012. If any of the mandatory information in the registration changes, the registered food facility must update the registration within 60 days with US FDA. The registered food facility must cancel the US FDA registration within 60 days, if the facility stop or ceases the operation. Previously registered food facilities that does not have US FDA registration information does not require re-registration such facilities can contact US FDA to obtain registration information. Every foreign food facility must have a U.S. FDA Agent who acts as the domestic communications representative for that facility. Foreign facilities must provide the US FDA agent information at the time of FDA registration, and must update the FDA registration information if the facility changes the US FDA agent. The food facility registration and prior notice helps US FDA with information on the origin and distribution of food products and thereby aid in the detection and quick response to actual or potential threats to the U.S. food supply. Registration information also helps US FDA to notify the food establishment that may be affected by the actual or potential threat. The US FDA registration statistics shows 171,552 domestic registrations and 278,307 foreign registrations as of July 19, 2012. 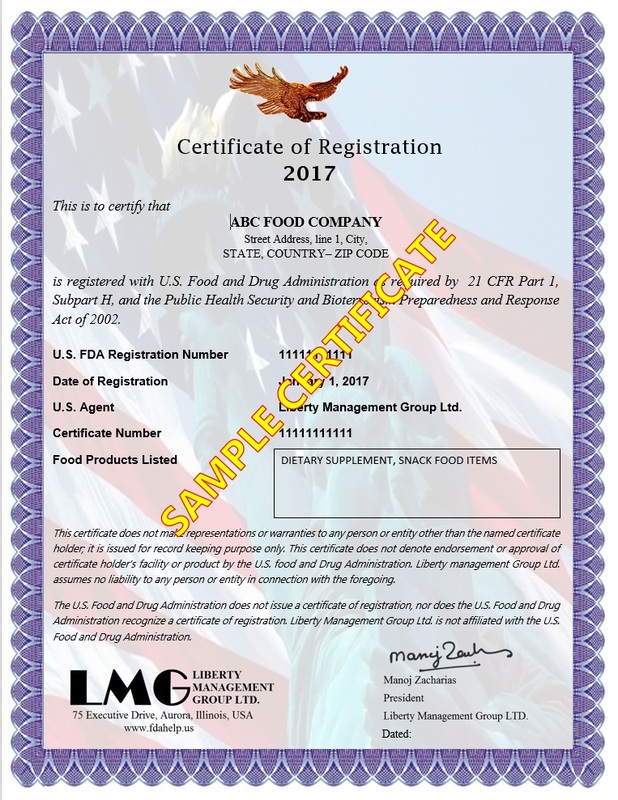 Liberty Management Group provides assistance in US FDA food facility registration and helps to comply with FDA bioterrorism act requirements. LMG also provides US FDA Agent service for foreign food facilities. Please note US FDA does not issue a certificate of registration, nor does the US FDA recognize a registration certificate issued by third party, but the US FDA issue a registration number for each registered food facility, FDA registration number does not denote the US FDA approval of the facility.